Europe added a total of 4.5 gigawatts (GW) of new wind energy throughout the first half of 2018, according to new data from WindEurope, down by 26% on the same period a year earlier, heralding what some believe are “worrying trends” for the market. A total of 3.3 GW worth of new onshore wind was installed over the first half of the year, led by Germany, which installed 1.6 GW and nearly tripled that of the next closest coutnry, France, which installed only 605 MW. Denmark trailed in third place with only 202 MW. Things were a little better off the coasts, with the offshore wind industry installing 1.1 GW, led unsurprisingly by the UK with 911 MW which saw the 573 MW Race Bank Offshore Wind Farm brought online in June (seen right). 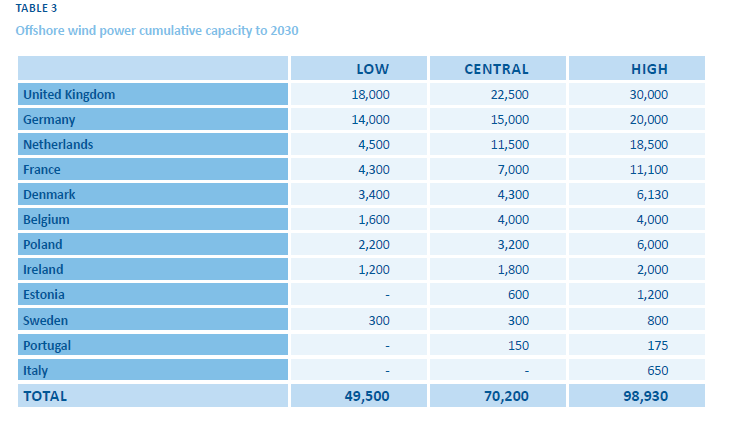 The offshore wind industry, which is still theoretically in its infancy, needs to be judged accordingly, but even so, only four other European countries any offshore wind capacity — Belgium with 175 MW, Denmark with 28 MW, Spain with 5 MW, and France with only 1 MW. Looking forward, Wind Europe — the wind energy trade body for Europe — expects a total of 10.2 GW of new onshore wind capacity to be installed and 3.3 GW worth of offshore wind, bringing its 2018 forecast to a total of 13.5 GW of wind capacity installed in 2018. “We are on track for a solid year in new wind farm installations but the growth is driven by just a handful of markets,” explained WindEurope Chief Policy Officer Pierre Tardieu, before adding that he believes the “figures also mask some worrying trends. “France has installed a lot of new onshore wind this year but they haven’t issued a single new permit for onshore wind permit in the last eight months because of an administrative issue – which has also resulted in their latest auction being under-subscribed. So there’ll be a drop-off in their new build now, creating uncertainty in the supply chain. “In Germany, it’s good that projects now need a permit to bid into onshore auctions, but that rule now needs to be made permanent. Also, there’s no clarity yet on when the 4 GW new onshore wind promised in the coalition agreement for 2019-20 is going to be auctioned. And the new Government is slow in confirming the auction volumes beyond that. Like all Member States, they now need to give five years’ visibility on future auction timetable and volumes – under the terms of the new Renewables Directive. This, however, is the long-term silver-lining — the European Union has recently agreed upon a new renewable energy target of 32% which, while well under what many campaigners and even some EU Member States had been calling for, is nevertheless better than nothing (and better than the previous 27%). This allows the EU to begin focusing on how to bring about this new target, which gives the wind energy the needed clarity. Similar clarity was also recently provided by the UK Government in announcing new competitive auctions for the offshore wind sector (and remote island wind providers) beginning in May 2019, and repeating every two years, with the intention of adding between 1 and 2 GW every two years. This burgeoning clarity out to 2030 is not just happening in the UK. Denmark has set a target of reaching 55% renewable energy by 2030, which is set to include 2.4 GW worth of new offshore wind capacity, and Lithuania has set a target of 45% renewable energy in its energy mix by 2030 and 100% by 2050, with wind energy set to account for over half.